Changes for University of Maryland athletics may be on summer's horizon, but university academics have already begun reaping the benefits of UMD's Big Ten move. This year, UMD officially joined the Committee on Institutional Cooperation (CIC) as a part of its broader integration with the Big Ten, and has plans to celebrate this integration at the Department of Linguistics' annual Maryland Mayfest conference. 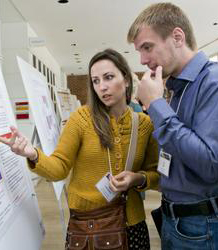 Maryland Mayfest is a yearly workshop that brings together researchers from a variety of disciplines and perspectives to discuss fundamental issues in language science. This weekend, the linguistics department will springboard collaboration between CIC scholars by inviting language scientists from Big Ten institutions to participate in Maryland Mayfest at Marie Mount Hall. Mayfest participants will engage in discussions to stimulate insight about prosody, language acquisition and communicative disorders. The department has invited a speaker from each CIC institution to speak about a broad theme in language science that relates to theoretical research and how it can inform experimental practice. CIC universities are among the best in the nation for linguistics, and nearly every CIC institution offers a department or program in the speech field. University of Maryland linguistics ranked first among the CIC schools in the 2010 NRC ranking of research doctoral programs, and hopes to draw on the experience and knowledge from other Big Ten universities at the Maryland Mayfest conference. The conference runs all day Friday and Saturday May 2-3. For more information about Maryland Mayfest, visit http://ling.umd.edu/mayfest/2014/.